Dressing up for a Halloween or costume party can give adults a chance to show a less serious side of their personality. Since many couples choose to attend parties together, it's a great idea to decide on a specific costume theme. A Hollywood theme gives couples an opportunity to dress up as celebrities, infamous figures, fictional characters from televisions and movies, and other couples famous in Hollywood. Dressing up as a Hollywood couple gives you a chance to experiment with your favorite star's look while walking in their shoes for a day. Consider the celebrity couple's famous style when deciding what to wear. Dress up as Angelina Jolie and Brad Pitt. Angelina typically wears long, elegant dresses that show off her tattoos and toned arms. Brad typically sports a clean yet gruff appearance. Pair a suit with a fedora and a goatee to get his look. For a more cynical approach you may also want to carry a few dolls to represent their growing number of children. Beyonce and Jay-Z are a hip Hollywood pair that is extremely popular and successful. Recreate Beyonce's look by wearing a golden blond curly wig, mini dress, and sky-high stiletto heels. Jay-Z is known for wearing designer jeans, a button-up dress shirt, the latest sneakers, and a pair of dark shades. Gwen Stefani and Gavin Rossdale are a hot rock couple with plenty of style. Both of their styles are extremely unpredictable, so feel free to experiment with these looks. Don't forget their standard stylish shades and Gwen's famous blond locks. As president and first lady, Barack and Michelle Obama are one of America's most famous couples. Michelle Obama is known for showing off her famous arms in long, sleeveless gowns paired with high heels, while the president prefers tailored suits paired with stylish dress shoes. Other famous Hollywood couples include Will Smith and Jada Pinkett Smith, Jennifer Lopez and Marc Anthony, Demi Moore and Ashton Kutcher, and the now divorced Kate and Jon Gosselin--which should garner a few laughs. 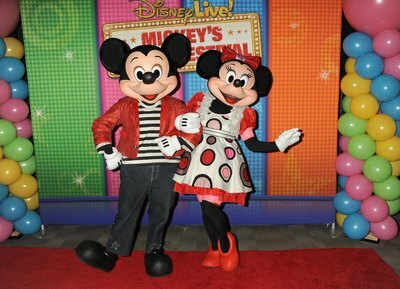 Hollywood cartoon couples often provide some of the most recognizable costumes because their looks typically never change. Fred and Wilma Flintstone or Betty and Barney Rubble are ideal costumes for the couple who doesn't mind showing off their legs. Look for costumes that also include wigs and foot-style shoe covers for a more authentic look. 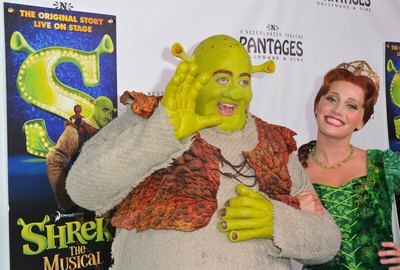 Shrek and Princess Fiona are one of the most popular fairytale couples. Many stores offer variations of Princess Fiona's look, including both long and short dresses. Little Red Riding Hood and the Big Bad Wolf aren't the typical cartoon couple, but they're definitely a famous pair with many costume variations to choose from. Catwoman may be one of the most infamous Hollywood anti-heroines, but paired with Batman they make a fearless duo. Other Hollywood cartoon couples you may consider include Aladdin and Jasmin, Popeye and Olive Oyl, Hansel and Gretel, Fred and Daphne from "Scooby-Doo", Mickey and Minnie Mouse, and Homer and Marge Simpson. Wearing a costume based on fictional television and movie characters or fictional characters in history takes a lot of the guess work out of picking the right costume. Don a medieval costume to become Shakespeare's star-crossed lovers, Romeo Montague and Juliet Capulet. If you don't mind a hairstyle that resembles a cinnamon bun, consider dressing as Princess Leia and have your partner dress as her prince Han Solo. Dress as English folklore's popular couple outlaw Robin Hood and his love Maid Marian. For a touch of elegance and glamor, dress up as "Gone with the Wind"'s Rhett Butler and Scarlett O'Hara. With a lot of patience and blue make-up, you and your partner can also become Neytiri and Tsu'tey from "Avatar". Other Hollywood themed couples costumes may include Al and Peg Bundy ("Married with Children"), Lucy and Ricky Ricardo ("I Love Lucy"), Heathcliff and Clair Huxtable ("The Cosby Show"), Lancelot and Guinevere ("Le Morte d'Arthur"), Edith and Archie Bunker ("All in the Family"), and Danny Zuko and Sandy Olsson ("Grease"). What Costumes for Guys Would Go With a Ladybug?